be quiet! may have introduced some fabulous chassis in recent years - the Dark Base 700 being our pick of the bunch thus far - but the German manufacturer isn't resting on its laurels and is responding to user feedback with incremental upgrades across the range. 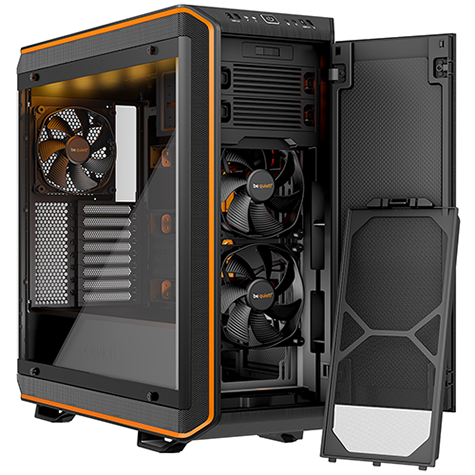 In for review today is the Dark Base Pro 900 Rev 2, a £259 enthusiast chassis that takes the 2016 original and fixes just about every niggle we identified in our initial review. 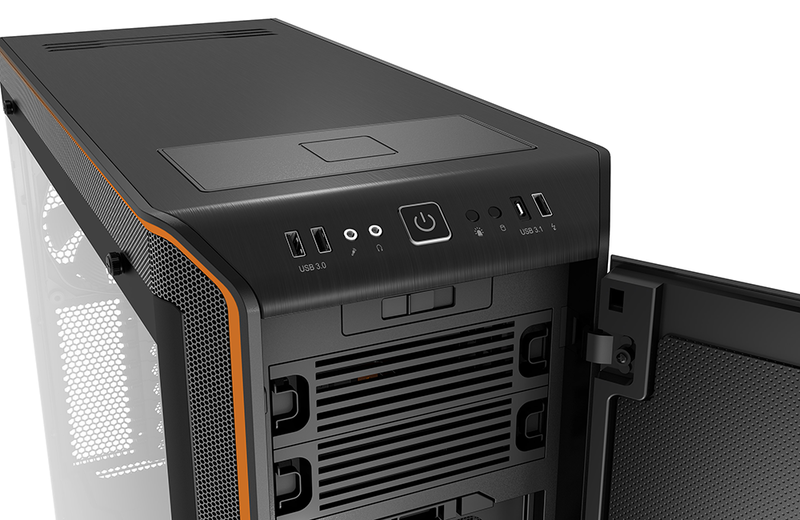 The resulting product is, in our estimation, one of the best high-end PC enclosures available on the market today, so let's dig in and see what's new. At first glance the Rev 2 could easily be mistaken for the original Dark Base 900, but that's no bad thing, as this was always a case of real beauty. Despite measuring a mammoth 243mm (W) x 586mm (H) x 577mm (D) in size, tapered edges, angles in all the right places and an expansive tempered glass side panel help soften the overall appearance; it's still a huge case that tips the scales at roughly 15kg, yet it happens to be one of the sexiest chassis of this size. And don't worry if the orange highlights aren't your thing, silver or black options are available. While it all looks familiar, there are a handful of noteworthy tweaks within that combine to make a good case even better. 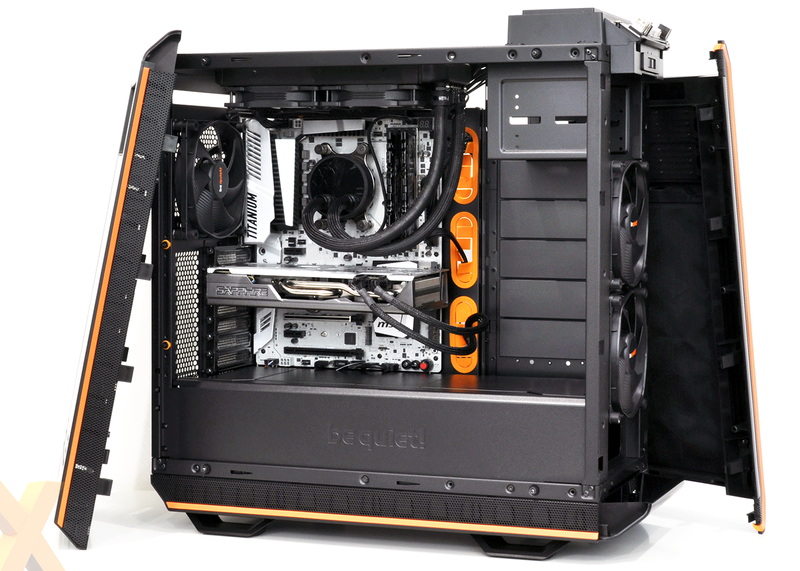 Our biggest bugbear was the lack of a PSU shroud, and be quiet! has rectified that omission with a full-size cover that hides cables and can be inverted if you choose an alternate interior layout. The top of the shroud is equipped with five modular covers that can be individually removed to route cables, or one can be swapped for a 2.5in drive tray, and much like Dark Base 700, there are now covers for the entire storage column, creating a tidier finish when the metal 3.5in drive sleds are removed. In a similar vein, the top and bottom tips of the side window have also been painted black to hide any screw holes beneath. These changes all help refine the appearance of the case, yet there are functional upgrades, too. 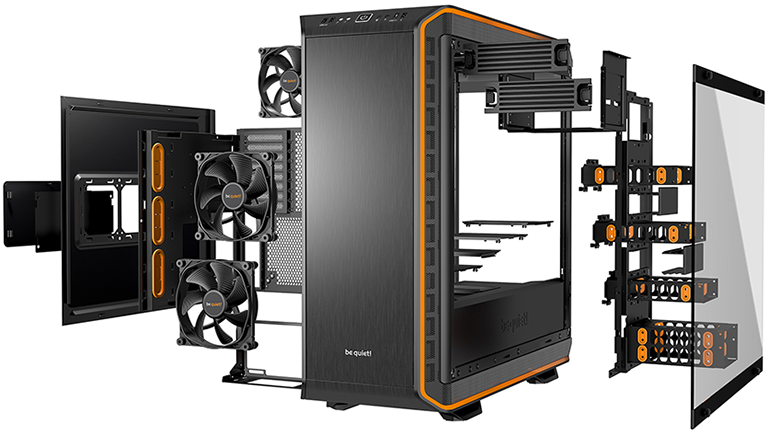 The integrated fan hub now supports eight PWM fans, the two bundled RGB LED strips are 12V for wider compatibility, and of course the I/O panel has been brought up to date. Lining the top-front edge, the ports now include USB 3.1 Type-C Gen 2, two USB 3.0, and another USB Type-A exclusively for quick charging. There is also a pair of customary audio jacks and an LED toggle switch, as well as a fan speed controller behind the front door, but we're disappointed to find that the reset button has fallen by the wayside. There seems to be less call for hulking full-tower solutions these days, yet be quiet! appreciates that those who play in this end of the market are intent on going all-out. 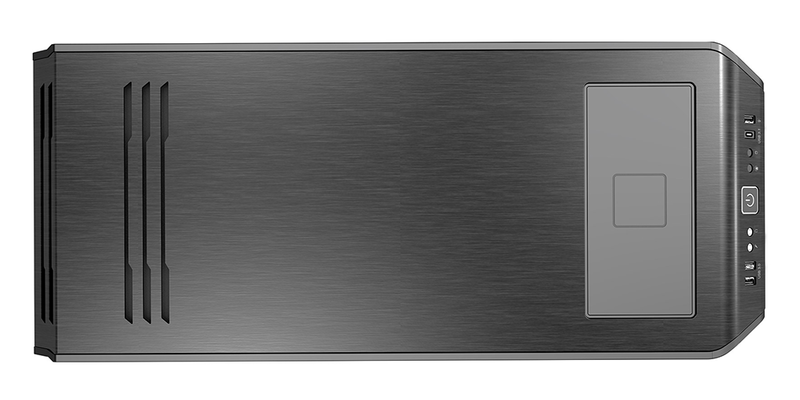 If that sounds appetising, you'll like the fact that Dark Base Pro 900 Rev 2 takes flexibility seriously and caters for just about any manner of build. We'd recommend revisiting our 2016 review for a more thorough overview the various features, as almost everything that was good about the original remains intact. The highlights include a reversible, sound-dampened, push-to-release front door that reveals access to your choice of dual 5.25in drive bays, three 140mm fan mounts, or a mixture of the two. Conforming to the high-quality feel throughout, be quiet! bundles a trio of 140mm SilentWings 3 fans as standard; two configured as front intakes; the other a rear exhaust. Appreciating that most users will want to expand on that, there's room for another 140 up front, two 120/140s in the base, and either three 140s or four 120s in the roof. Goes without saying, you could get at least a couple of extra-large radiators inside this beast. Versatility is the name of the game, so as before, the guts of the chassis can be ripped out and reinstalled in an inverted layout. We're not convinced many users will actually choose that path - the final build looks better the regular way up, in our estimation - but the modular interior is useful. Being able to remove the motherboard tray is helpful when installing intricate cooling, and it can be put back at different heights, in case you need a larger gap at the top for a push/pull rad. Alternatively, raise the tray if you're wanting to maximise the eight expansion slots with multiple GPUs, though do be aware there's no option for a vertical GPU mount - that's one thing the chassis won't do. 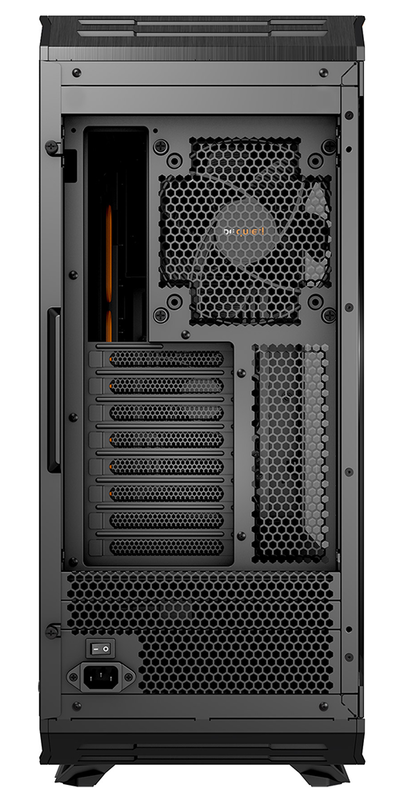 The array of possibilities is nevertheless impressive, yet they also make Dark Base Pro 900 Rev 2 something of an acquired taste, as it isn't the easiest case to build into. There are a lot of parts to contend with and the modular reversible interior is such that various elements have to be removed to get access to certain areas. 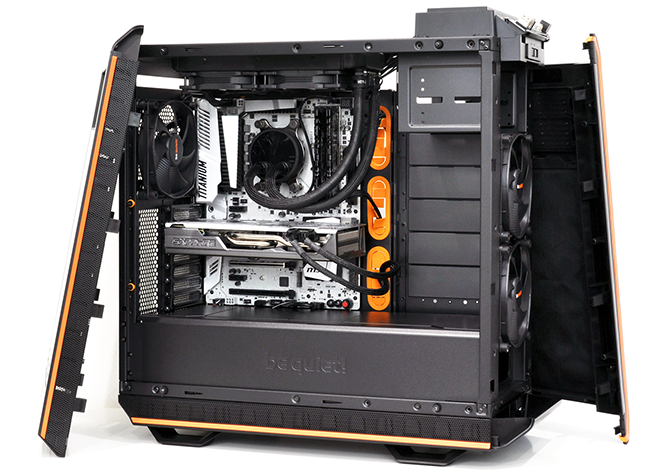 Take the power-supply bay, for example, which sits further in from the back of the case and attaches to the rear switch via a bundled cable. Your PSU will sit comfortably on rubber pads, in a choice of orientations or locations, but getting it installed in the base of the chassis requires removing the whole PSU shroud, and preferably the motherboard tray for maximum wiggle room. There are plenty of screws to unfasten along the way, and many of them are of different shapes and sizes, so you'll need to work methodically if you want to put it all back together without any head scratching. Still, if you're of the opinion you want to build it once but build it right, be quiet! 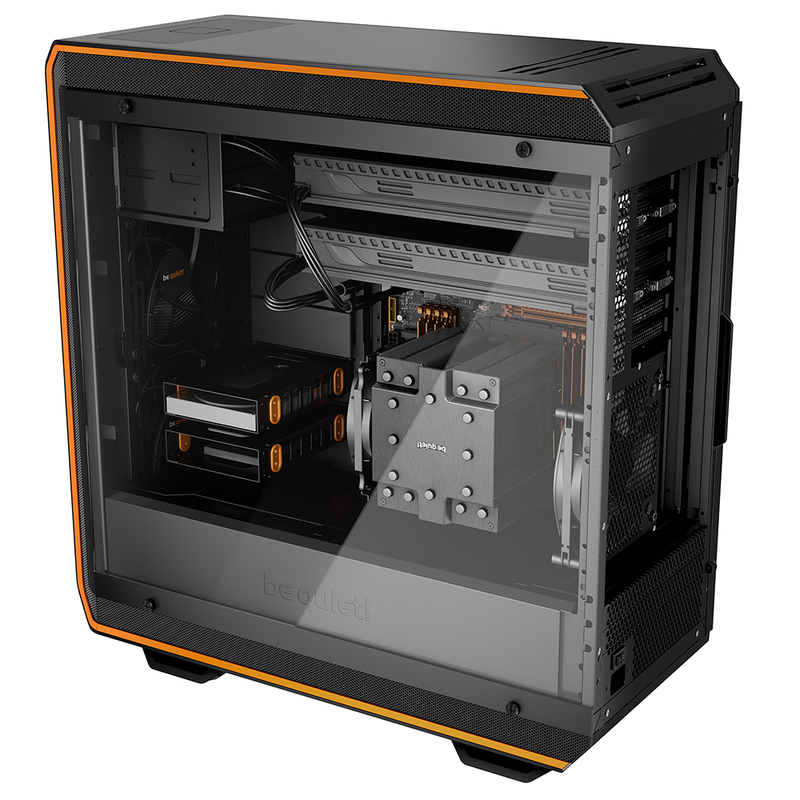 has you covered with support for a choice of E-ATX, XL-ATX, ATX, M-ATX, or Mini-ITX motherboard, CPU heatsink clearance of up to 185mm, GPU clearance of up to 470mm, five metal 2.5/3.5in drive bays (two as a cage, three individual, all removable) and a pair of 2.5in SSD trays. 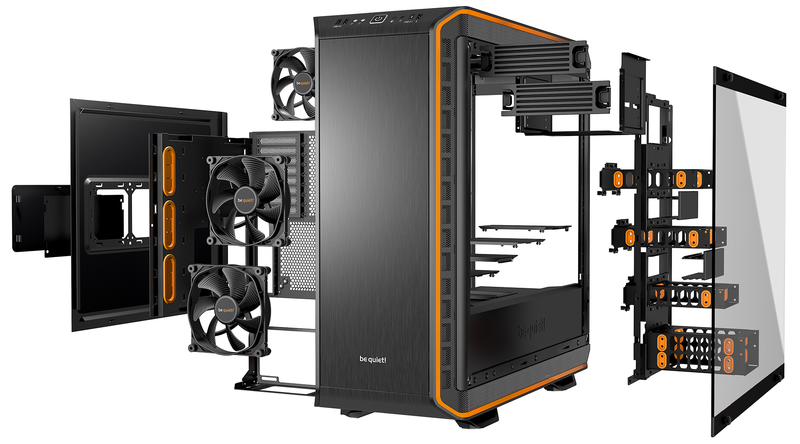 There's even a bracket for installing a liquid-cooling pump or reservoir, and the size of the accessories box alone suggests that Dark Base Pro 900 Rev 2 will cater for every eventuality. Heck, we've rambled about so many features we'd almost forgotten there's also a Qi wireless charger integrated into the top of the chassis. Building into the case feels like a proper DIY project, as there are so many permutations to consider. We've chosen to lower the motherboard a touch, giving us room to install our 240mm liquid cooler up top and leaving a void in the roof for more fans in a push/pull setup. 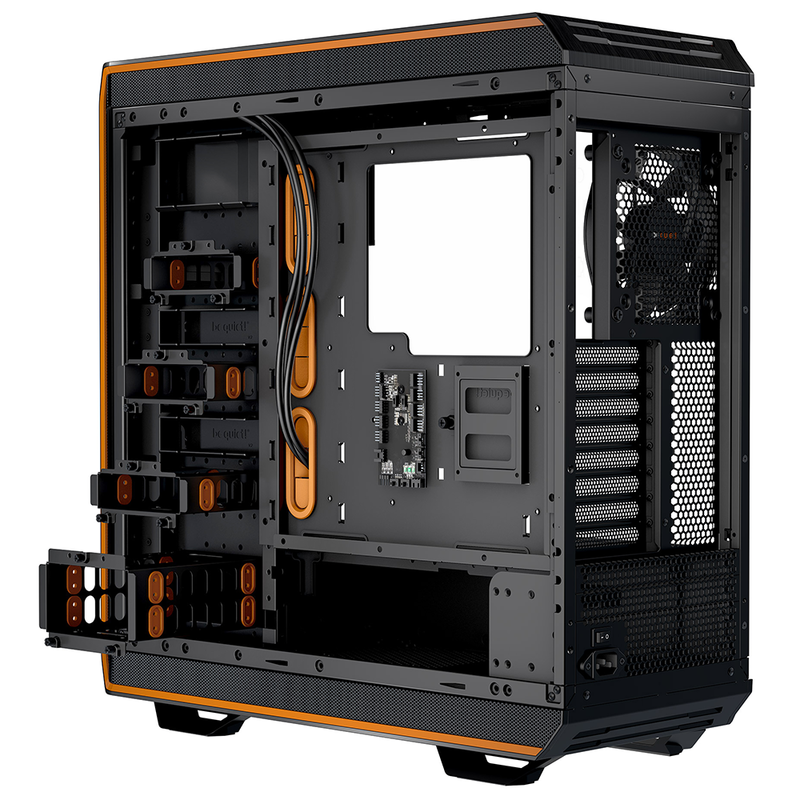 Depending on orientation, you can create a gap of up to 99mm above the motherboard tray, and we like that be quiet! has taken onboard our feedback and produced a more comprehensive user manual to outline the various layouts. We're surprised the front lighting strips introduced on the Dark Base 700 haven't been carried over - they look quite trendy on the smaller sibling - but save for the lack of a reset button, there's very little to dislike about the Dark Base 900 Pro Rev 2. 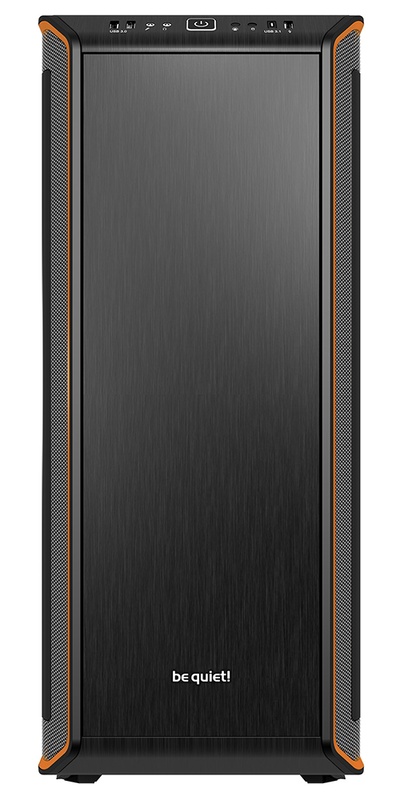 And if you're feeling aggrieved about your regular Dark Base Pro 900 purchase, there's good news as an optional kit featuring the PSU shroud, HDD slot covers and new side window will be coming to retail as a standalone upgrade, though our understanding is that the kit won't include the refreshed I/O panel.